The famous giraffe returns as the face of Geoffrey's Toy Box. It's been a tough year for the face of Toys R Us, Geoffrey the Giraffe. Last September, when the famous toy retailer filed for bankruptcy, it looked like the long necked mascot's days were numbered. However, in a controversial move, it looks like Geoffrey is back to work as part of the branding and logo design for Geoffrey's Toy Box. Not familiar with Geoffrey's Toy Box? If the company looks and sounds like an exhumed Toys R Us, that's because it is. According to a statement issued yesterday, the company has been bought out by a group of investors led by Geoffrey, LLC. 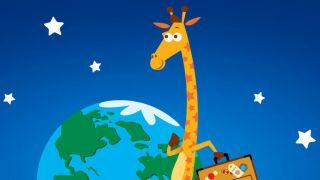 The acquisition includes intellectual property and data associated with Toy R Us, including the childhood favourite of many, Geoffrey the Giraffe. In the world of the brand created by Per Barry though, Geoffrey's reappearance has been sold as his return from a vacation. In a tweet from Toys R Us he's even strolling back with a packed suitcase, downplaying any suggestion of his recent crisis. As for the logo of Geoffrey's Toy Box, Geoffrey's bursting out of a toy chest with the anxious expression of a giraffe on borrowed time. This upbeat, 'everything's fine' attitude has provoked a backlash from former Toys R Us employees, plenty of whom are still waiting for severance pay. Many have seen it as a PR stunt to cash-in on the nostalgia associated with Geoffrey the Giraffe, one that adds insult to injury for employees loyal to the Toys R Us brand. With the run up to the holidays already underway, the launch of Geoffrey's Toy Box is certainly a canny business move, which could see investors leverage the brand and help pay off Toys R Us' remaining debts. For ex-workers though, the use of the brand will feel like nothing more than exploitation.